I started onDec.16, 2018 as a buyer and I just checked placedover 120 orders by now. understand my point of view. why should they care about you. Be fair and be reasonable. 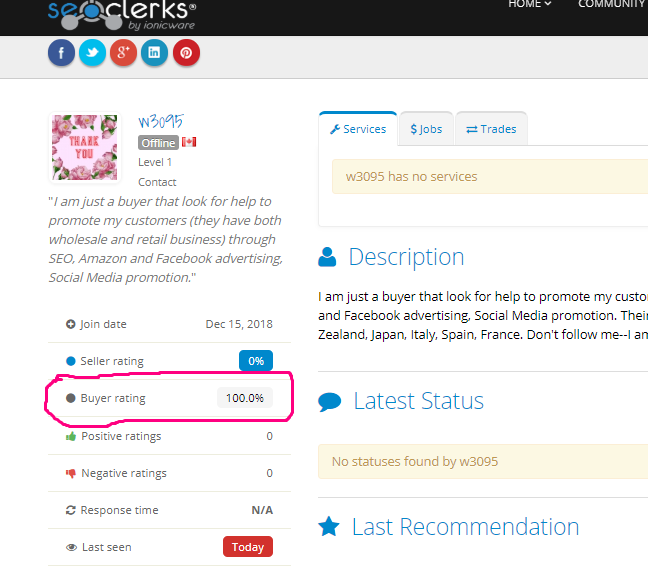 services/results, so the buyers have reason to stay with you. accept is: I order traffic from USA but got traffic from Cambodia. All in all, I think the buyers here are for results. I hope this will help you to understand us as buyer better and create great products/services and then get a lot of business—it will be a win win situation for both parties. Best of luck and thank you for reading! why should they care about you. Be fair and be reasonable." We take care of both our buyers and sellers equally We try to see the purchase from both sides and will help out the person who was right. As for not finding the right services that really "WOW" you, it just takes time. I completed the Order but buyer not reviewing and responding, what do I do?